Open Monday to Saturday from 9 a.m. – 6 p.m. I would like to visit the Musée du Parfum this Sunday. Are you open? Unfortunately, the museum is closed on Sundays. It is open from Monday to Saturday from 9 a.m. to 6 p.m., except January 1st, May 1st and December 25th (exceptional closure). I would like to visit the museum during my stay in Paris. What do I have to do? Do I need to book? There's no need to book. The museum welcomes you free of charge. All you have to do is go to the museum reception. The guided tours are free and take place every 20 minutes approx. What is the latest time I should arrive for a tour? Guided tours are free and last between 30 minutes and 1 hour. 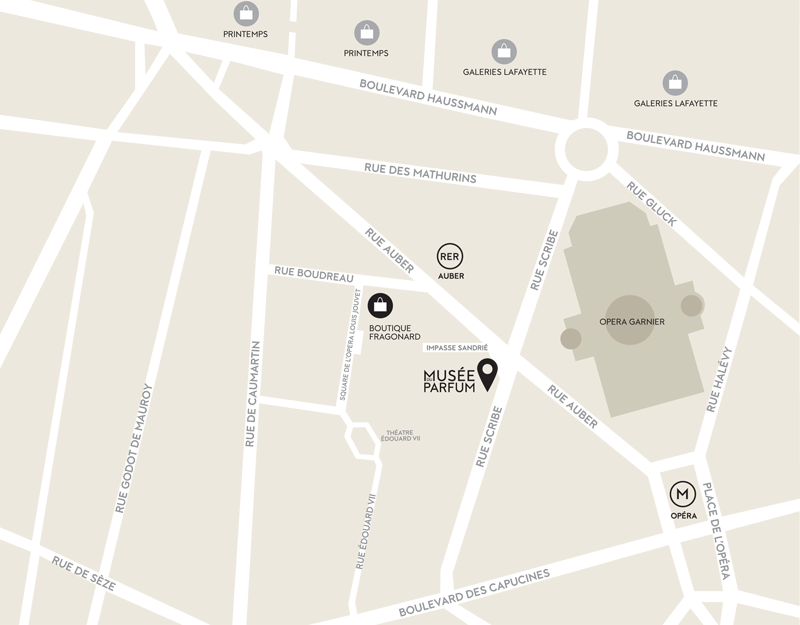 We therefore recommend you arrive before 5 p.m. to have time to discover the museum. From what age can you visit the museum? There is no age limit. Children remain under their parent's responsibility during the tour. I can't get anyone to look after my dog. Are pets allowed? For the safety and comfort of our visitors, only small dogs held in the arms or in a bag are admitted on tours. I'm only in Paris for the weekend and will have my bags with me. Do you have a cloakroom for my belongings? Unfortunately, we do not have a cloakroom for visitors.